Interested in an MFA from our Department? Click here for information. Please read that entire page before calling with questions, as they may be answered there! The Department of Art Practice provides a professional art training within the context of a world-renowned research university. We offer both the Bachelor of Arts degree (B.A.) and the Master of Fine Arts degree (MFA). 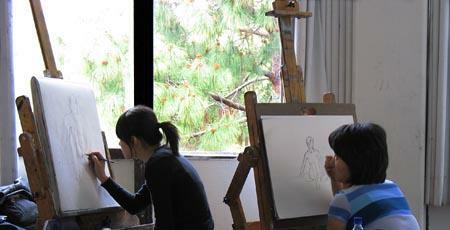 Undergraduate students may also choose to receive a Minor in Art Practice. Art Practice is headed by a core faculty of internationally recognized artists, augmented by three continuing lecturers as well as a changing roster of lecturers. The department provides a strong grounding in traditional artistic skills to complement a full curriculum of courses in new genres, electronic media, and critical practices. Art Practice draws gifted and independent students who thrive in a creative environment that encourages experimentation. Our students are uniquely poised to develop rich intellectual lives through contact with the University's exceptional resources. Our libraries, museums, and liberal arts and sciences form the background of a powerful artistic education. The result is a distinguished list of graduates who have made significant contributions in their field. The Berkeley Art Museum and Pacific Film Archive offer students the opportunity to participate in curatorial internships, and to view exhibitions and screenings throughout the year. Exibition opportunities are provided by our Worth Ryder Gallery, devoted to shows that bring students, faculty, and the community into dialogue. Art Practice's visiting artist lecture series brings 6-8 internationally-known artists to the Berkeley campus each year. Berkeley's Art, Technology, and Culture Colloquium provides an additional 10 lectures per year by some of the most innovative artists and thinkers in the world.